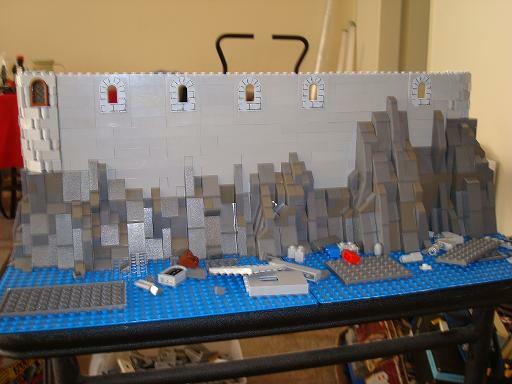 Hey guys I've started a new MOC. I'm now making a fort and small village/trade port here are some photos I took, sorry some are a little blurry but please give feedback. I'm building it on 6 green 32x32 base plates 4 32x32 blues and 2 16x32 blue base plates.So far I'm not sure how many or what type of buildings I'll be putting in the village but here is the layout so far, tell me what you think. I love what you have so far, the rock work and wall look great. I hope your not running out of bricks, I see a rainbow going on inside. Thanks Cam, I actually started off the project with those big modular wall pieces. When I was using those as a base it was hard to work with them, so I then decided to use my multi-colored blocks as the base. 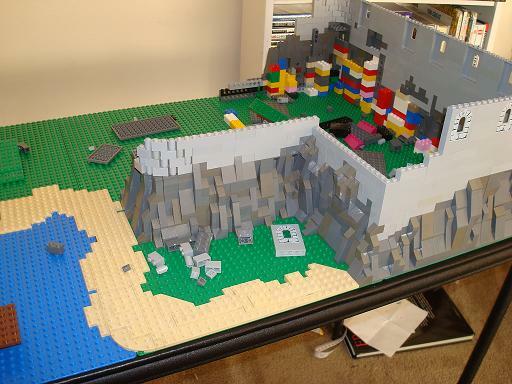 I still have plenty Grey slope pieces ,once I get the fort built I'm then going to go cover all that rainbow up with Grey plates. You walls look a little ...Flat? for lack of a better word, the rock work is great but after that it kind of gets boring. You can break it up a bit by using the odd textured brick here and there, but on a wall that scale you might need more to kill the monotony a kick back perhaps? Still early days, I'm looking forward too more. It's great The windows in the curve look good and I like th rocks. EDIT:I think the admiral's damaged idea would look good. 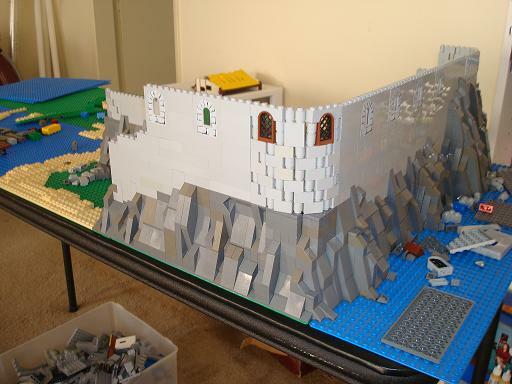 I like the fact that the border between the rock and the fort looks very natural because it's not a straight line. I also like the windows, and the curved part of the wall. But I do agree with TazManias that you could make the plain wall a bit more interesting. A bit more texture, perhaps a damaged part. A few plants on the rocks and elsewhere make it more realistic too. But perhaps that's more like a finishing touch. Thanks everyone for the feedback, yeah I will add some darker Grey into the wall to give it some texture so its not so bland.Maybe even some green to give a algae look. 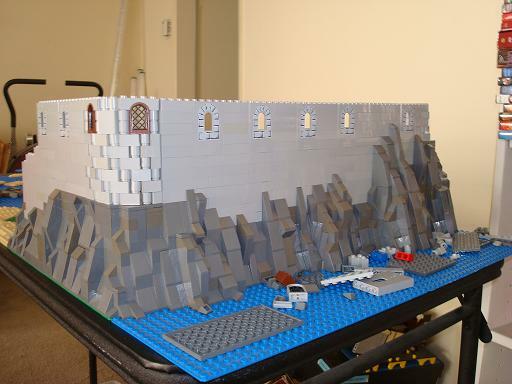 The curved walls I learned from classic castles website they have a good wall curving tutorial on there. 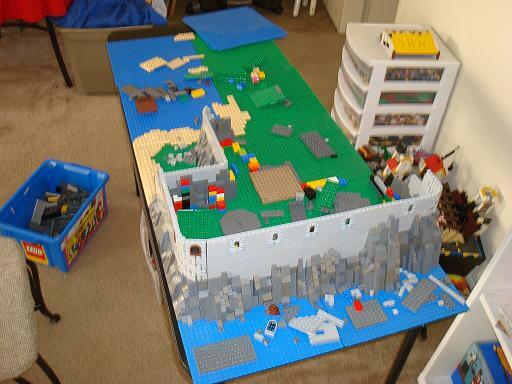 Anyways I've been trying to find pictures on the net of old forts but haven't found any good ones? I'm kinda building it from the potc movie getting ideas from that fort.